Lin Shuai was antics and business at "USA vs. China" kicking his way to a unanimous decision victory. Sino-US relations took another big step towards cooperative diplomacy at Harrah’s Las Vegas Hotel & Casino on November 13th, as the televised Chinese martial arts series WuLinFeng and In Sync Productions’ World Combat Kickboxing (WCK) presented “WuLinFeng Las Vegas Spectacular: USA vs. China.” This event was taped for broadcast on Henan TV in China, as well as other international carriers of WCK Muay Thai. “I thought there were some great donnybrooks,” said Dennis Warner, event promoter and In Sync president. The nine-bout pro-am card was a mix of seven WuLinFeng rules and two full Muay Thai rules, with the Nevada State Athletic Commission overseeing sanction and regulation. In the end, China edged out the Americans, winning five matches, including both WCK full rules Muay Thai matches. However, the Americans had their moral victories as well, winning three matches under WuLinFeng rules. The lone female match on the card, a WCK full rules Muay Thai match, ended in a draw. WuLinFeng closely resemble K-1 kickboxing rules, which prohibits elbows to the head and does not count trips to the ground as knockdowns. Between the rules in most matches and the Chinese-heavy crowd, the night was a showcase of Chinese martial arts stars. And although that didn’t prevent the American side from providing formidable opposition and even a few upsets, the design and booking behind the night was not only clear, but on many levels, intentional. “Primarily, we marketed to the Chinese audience, and part of that was the date. Manny Pacquiao is fighting the same night, so we focused more on doing the Chinese fighting style . . . when you’re trying to expand a market, you have to go into some demographic groups that don’t necessarily understand fighting, but when they come and get energized by it. . . I had so many Chinese Americans come up to me and say ‘wow, we never come, but we really love this, and we want to come back’,” explained promoter Dennis Warner. 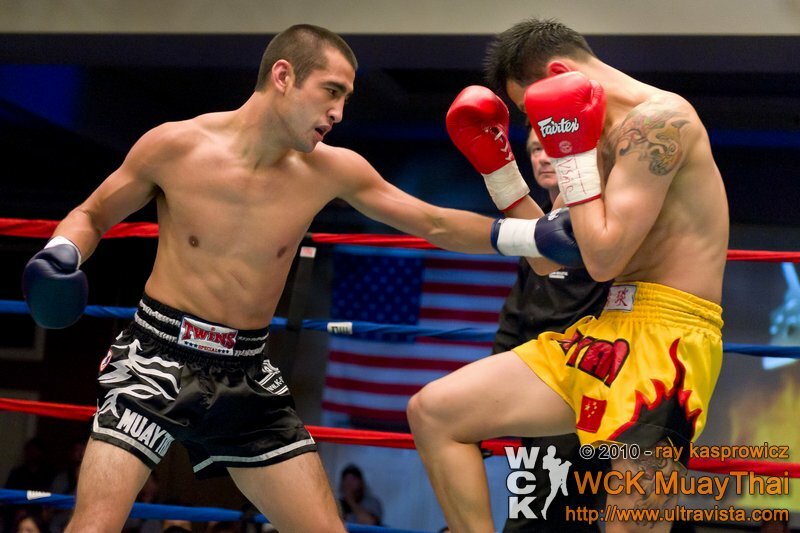 Southern California's Shane Oblonsky used body shots to upset Xu Yan via unanimous decision. Among the highlights of the night was a career-vaulting decision win by Southern California’s Shane Oblonsky over Xu “The Chinese Lion” Yan, a K-1 fighter who recently beat Muay Thai legend Malaipet Sitraprom in Malaysia. With a win over such an accredited opponent, Oblonsky finds himself several notches closer to title contention. “Shane fought on many of my shows. I turned him pro. He got knocked out in his first fight, and since that first fight, he’s won five in a row. So he’s really become a force of nature. I look forward to seeing him vie for a WBC national title pretty soon,” said Warner. Likewise, Adrien Grotte claimed the finish of the night, a second-round KO on Yi Long via left hook. Ironically, it was Yi, the self-proclaimed “Warrior Monk,” who established an early lead, tripping Grotte twice in the first 30 seconds of round one. “We knew he was going to be awkward, because he’s not really fighting out of a Muay Thai or kickboxing type position. He’s trying to incorporate some traditional kung fu, which is cool, I guess. . . He’s very fast. He’s good right side, left side. But he had nothing that was scary . . . And he drops his hands. You just can’t do that in front of Adrien,” said Grotte’s trainer, Bob Karmel. “I’ve been trying to get Adrien on one of [Dennis’] cards, because Adiren’s a very impressive fighter. He has that physical look that’s good for marketing, and he’s a strong, devastating fighter. . . He is one aggressive, hungry guy who can take some punishment and keeps on going. So when Dennis gave us an opportunity to fight on a bit of a high profile show like this, we just had to jump on it,” added Karmel. For the Chinese, the big finish was when Wang Hongxiang stopped “Cowboy” Heath Harris in round one with leg kicks, until the referee called off the match at 2:59, literally the last second of the first round. The two light heavyweights swung hard, heavy and wild, with Wang continuously attacking Harris’ knees and thighs, to chop down the big cowboy to the end. Wang is the captain of the Chinese team, and previously beat Joe Schilling last year in the same town. Likewise, big-name Chinese fighters Kang Er and Li Ning walked away with strong decision wins, though it was the demonstrably brash and theatrical Lin Shuai who provided the antics for the night. Lin, whose surname literally translates as “handsome,” came out with a very nontraditional swagger of arrogance, and continued to make big, challenging faces to his opponent, Alfred Khashkyan, and even the audience. The match itself was in impressive slugfest of alpha male attitude, though in the end, Lin proved to have the skills to pay the bills, earning a decisive unanimous decision. “You love those types of guys. He’s a good-looking guy. He loves being in the ring. He loves fighting. It makes it easy to be promotable. Because people identify with that. They want that confidence. They want that aura of invincibility. And he brings that,” commented Warner. WuLinFeng Cruiserweight Bout – Andy Kapel def. Guo Qiang 郭强 via unanimous decision on scores of 29-28. WBC Muay Thai International Super Lightweight Bout – Kang En康恩 def. Ben Yelle via unanimous decision. WuLinFeng Middleweight Bout – Hong Guang 洪光 def. Jack Thames via TKO / corner threw in the towel, R2, 2:52. WBC Muaythai Super Featherweight Bout (5 rounds) – Li Ning 李宁def. Nat McIntyre via unanimous decision off scores of 50-45. WuLinFeng Super Welterweight Bout – Shane Oblonsky def Xu Yan 徐炎via unanimous decision off scores of 30-27, 30-27, and 29-28. WuLinFeng Women’s Featherweight Bout – Tiffany vanSoest majority draw Wang Mung 王聪 off scores of 29-28, 28-28, and 28-28. WuLinFeng Super Lightweight Bout – Lin Shuai 林帅def. Alfred Khashakyan via unanimous decision off scores of 30-27. WuLinFeng Middleweight Bout – Adrien Grotte def. Yi Long 一龙 via KO, R2, 0:44. 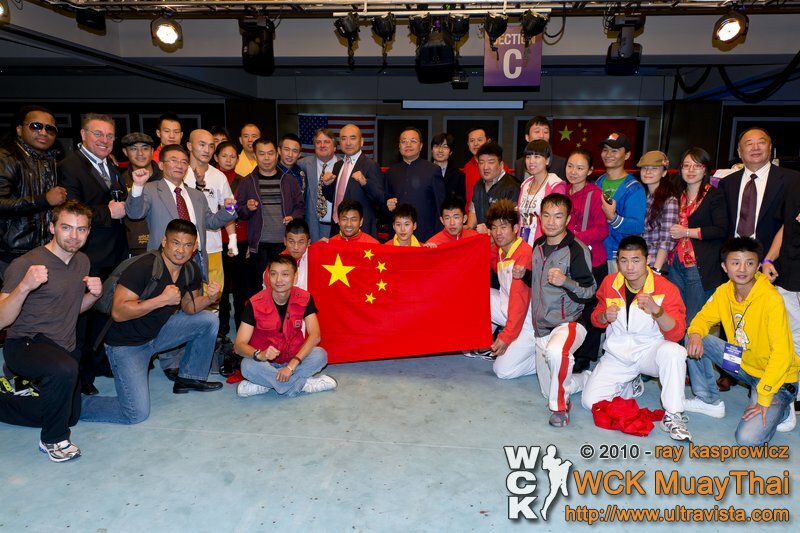 WuLinFeng and Dennis Warner's WCK came together on November 13th for their second "USA vs. China" series in Las Vegas, NV. The WuLinFeng – In Sync partnership dates back three years, when Warner started bringing Chinese fighters over for his Muay Thai events in the States. After awhile, a mutual talent trade started to develop, including several “USA vs. China” events in the People’s Republic. Their inaugural event with this theme was in August 2009 at the Las Vegas Hilton. Now, with a second domestic “USA vs. China” event under their belts, Warner acknowledges that the partners are looking to build and expand on the theme. This entry was posted on November 18, 2010 at 2:38 am and is filed under Live Event Reports with tags Adrien Grotte, Alfred Khashakyan, Andy Kapen, Ben Yelle, Cowboy Heath Harris, Dennis Warner, Guo Qiang, Harrahs Hotel and Casino, Henan TV, Hong Guang, In Sync Productions, Jack Thames, K-1, Kang En, Las Vegas Hilton, Li Ning Nat McIntyre, Lin Shuai, Malaipet Sitraprom, Muay Thai, Shane Oblonsky, Tiffany vanSoest, USA vs. China, Wang Hongxiang, Wang Mung, WCK, World Combat Kickboxing, WuLinFeng, Xu Yan, Yi Long. You can follow any responses to this entry through the RSS 2.0 feed. You can leave a response, or trackback from your own site.